Are You Looking For A Pea Ridge Electrician Today? electrical repairDavitt Electric is customer centric electrical company. Our clients are the most important thing to us, and it is our job to make sure you are 100% satisfied with all of our electrical services. The job is not done until you are completely satisfied with our work. Our Pea Ridge electrician focus on getting the job done right the 1st and keeping you under budget. We want to get the job done right the first so you are not bothered with repeat work. This saves time and money. 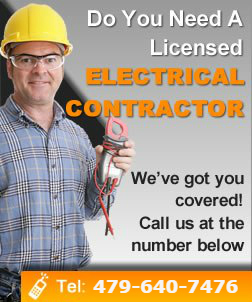 All of our electricians are licensed and fully trained in the latest techniques and up-to-date electrical code. Our Pea Ridge electricians are truly professionals because they stay up-to-date and trained in their craft. We guarantee that you will never be dissatisfied with our service. We have great customer service and low pricing. Davitt Electric is your #1 Pea Ridge electrician. Davitt Electric specializes in wiring residential new construction, remodels and electrical troubleshooting. David Electric also provides other electrical services to Pea Ridge such as panel upgrades, helping your with your insurance claim repairs, landscape and security lighting, whole home wiring, backup generator systems, fire and smoke detector installations, hot tub and spa hookups and more. We also provide 24 hour emergency service. Owner Joe Davitt, has been been a master electrician in the Northwest Arkansas area for over 10 years. Joe Davitt is not only extremely well-experience Pea Ridge electrician, but he is also licensed with a master electrician license and carries top of the line insurance. If you have lights that are flickering, outlets that are not working or circuit breakers that keep tripping, then call the expert Pea Ridge electricians at Davitt Electric today. Our master Pea Ridge electricians are able to handle all types of electrical repairs. With our expert electrical troubleshooting, our electricians will be able to diagnosis any electrical problem you may be having. Our electricians strive to bring the best possible electrical repair work in the industry. Our electricians are truly professionals; they stay up-to-date with all of the latest standards and electrical code. You can rest assure that when our Pea Ridge electrical repair experts complete your electrical repair it will be done right and will last. Protecting your home from a lightning strike is a smart idea. If your Pea Ridge home is hit directly by lightning it can cause major damages that will also hit your pocketbook. Damage caused by surges can destroy cell phones, computers, TVs, home theaters, telephones and Electrical appliances. Lightning strikes are no the only reason to acquire Pea Ridge surge protection. Downed power lines can also cause destructive surges when they are repaired. This will cause your appliances to go on and off which can cause serious damages to those appliances. Think of Davitt Electric Pea Ridge Surge Protection as one of the cheapest forms of insurance protection that a homeowner will ever purchase. When compared with the cost of replacing damaged eletronics or appliances, there is no comparison. If you are looking for a Pea Ridge electrician then please call 479-640-7476 or complete our online request form.